Hello everyone! Welcome to another great Thursday challenge from the Create with Connie and Mary team! This week we have a beautiful color challenge! Take a look! 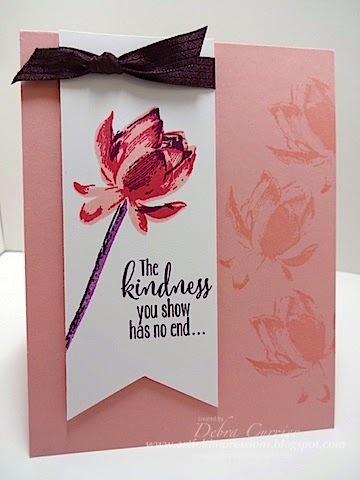 This is a super simple card but I do love how these colors look together with the Lotus Blossom! 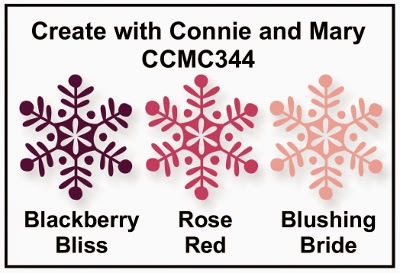 Be sure to visit the Create with Connie and Mary site to see what the other designers did with this challenge. I hope that you will play along with us this week! We always love to see what you do with the challenges! Thanks for stopping by and have a super day! These colors are perfect for a stamp such as Lotus Blossom. Also love how you used the flower to stamp tone on tone down the side. LOVE this card! In fact, I used it for my "bonus" card at last night's Club meeting! Great job with the color challenge this week! Looks like you and I were on the same wavelength this week using the Lotus Blossom. Love your creation! Ooh, I love the way you featured this color combination with the flower - adds high and low lights in just the right places! What a lovely card! I especially love the subtle lotus blossoms stamped along the side, such a nice detail. A beautiful lotus flower with those colors, just stunning! The subtle blossoms down the edge are a great background!